We have Halifax Street in SE26, that saved the remnants of the old railway workers cottages, the Thorpes that apparently are some of the best Edwardian houses in London. What about here? Thinking of my posting to Councillor Wise, the Post Estate should be listed (a) because of the 1930s character and (b) to stop the number of monstrocities that have appeared in the last ten years. Some of the Christmas houses could be a candidate but I expect that the area is too fragmented after post war development. I'd of course list the three breweries but somebody seems to have demolished them. No doubt FH Centraal will be a candidate for modern housing, embracing the Dutch way of living. Before I compose my letter to LBL it would be useful to know any support for the idea or alternatives. Although I slipped into 'listing' I am talking about areas with a particular historical interest for conservation areas. However, there is nothing east of the railway line. As Baggydave says, a strong case could be made for creating a conservation area to include the Christmas houses of Perry Vale, Sunderland Road and Gaynesford Road, perhaps also including South Road, Church Rise and the grade 2 listed Christ Church. Then there is Rockbourne Road and its surroundings. And why isn't the top of Taymount rise included? Or Horniman Drive? Would the Forest Hill Society be interested in forwarding this? Incidentally, what is the "Post Estate"? I was not aware the conservation area was so large in Forest Hill town Centre. 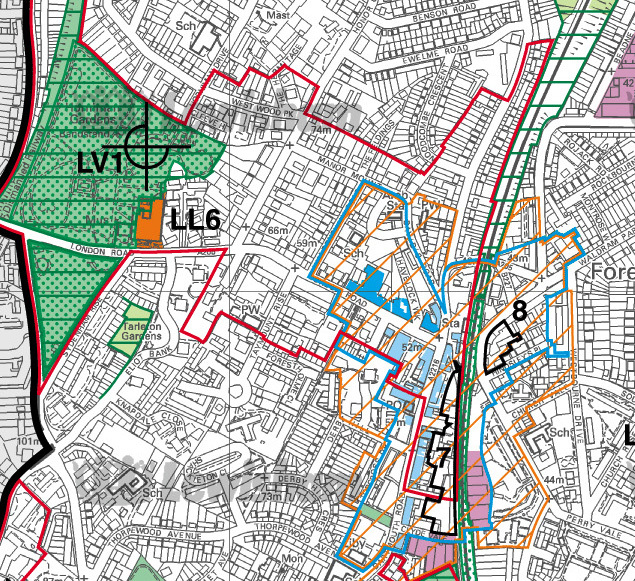 I notice from the UDP http://www2.lewisham.gov.uk/lbl/planning...fr066.html that there is another conservation area in Forest Hill, around Allenby Road and Garlies Road. An additional conservation between Perry Vale and South Road would seem to make sense, but I would not want the FH Society to make any decisions about conservation areas without consulting the people living on these roads. But I am not sure about BD's idea of preserving all of the Horniman hill while half of the residents seem busy converting their lofts. As for the top of Taymount Rise, most of the outside of the roundabout has been turned into flats over the last 20 years since I last lived here, so there are only one or two buildings that would make the area worthy of a conservation area. Meant to ask SG for his views - and what an excellent map. Thanks for this Steve. I hadn't realised that it extended so far from London Road. However, I am also disappointed to see that it does not include the corner of London Road and the Station/Dartmouth Road. I seem to recall that McKays were challenged over their sign on the basis of them being in the Conservation area, but apparently they, and everything else from Sainsbury's down to the lights, are not. 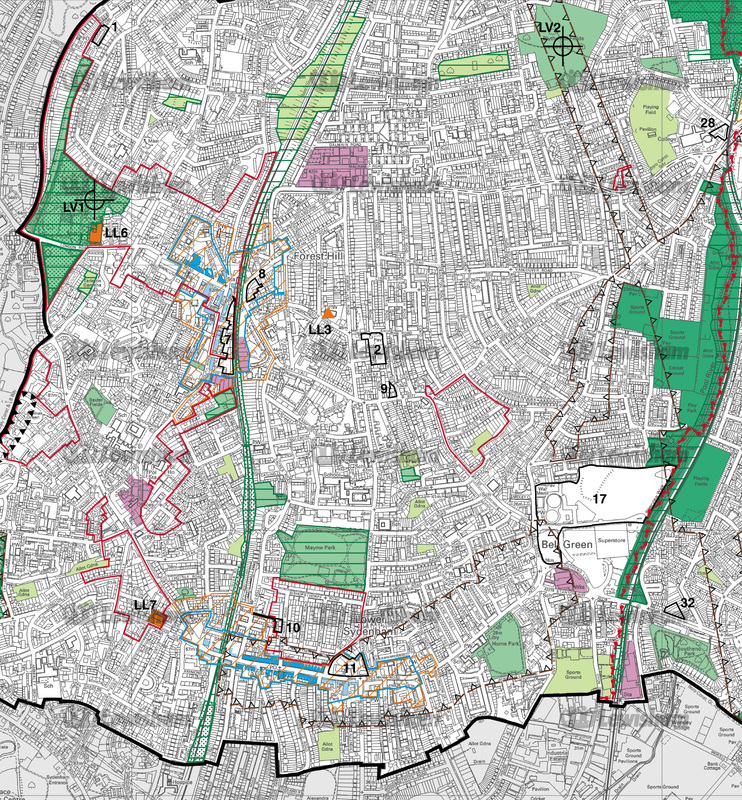 In fact, none of the commercial buildings in Forest Hill seem to be covered by this area, ... and nor is Havelock Walk. Can Steve tell us what the blue outline is? Seems to be around the "commercial" area of FH. Is this the case? 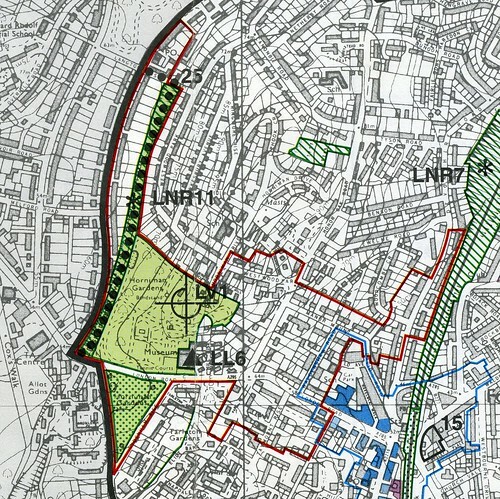 Also what the green hatched area is behind Liphook Crescent? Oh dear... please ignore my plan. It is out of date. I really should have checked. Michael's link shows the current state of the FH conservation area, which includes Havelock Walk and extends along London Road to the railway line. It also extends along Dartmouth Road. Blue line is the 'district centre'. Green hatching is a site of nature conservation on a urban green space. This is a closed reservior which is not accessible to the public. If you have trouble linking up the different maps from that site, I have put together the most relevant ones to make it easier to look through. It seems that there is a conservation area for Garlies Road and Allenby Road, but nothing for Gaynesford or Perry Vale. The terrace of Christmas Houses on Thorpewood Avenue at the back of Forest Hill Library probably deserve conservation as they have survived relatively intact. Christmas houses are unique to Forest Hill so we should conserve what is left on both sides of the railway. That's more like it, Rob. Thanks for getting me off the hook. Borderpaul, the Christmas houses in Thorpewood Avenue are actually in SE26. They, and other buildings in the vicinity, could be added to the Sydenham Park conservation area, but that is probably not a Forest Hill matter. I thought you were talking about the Christmas houses in Perry Vale. The names of the houses in a row start with c then h wtc.! Thanks, Robwinton, much clearer for the hard of understanding like me! Agreed that Gaynesford - and Perry Vale Christmas houses - would deserve conserving. I would be very happy to support you over extending the Forest Hill Conservation Area. Yes, the Christmas houses are very particular to forest hill and rather special and it would be a shame for them to be knocked around and changed. One of the things I am very sad about is the cinema. I think it should have been reinstated as a cinema. It is a beautiful old building and we could really do with a a cinema in forest Hill - especially somewhere for all the kids to go in the evening. One of the things I am very sad about is the cinema. I think it should have been reinstated as a cinema. It is a beautiful old building and we could really do with a a cinema in forest Hill - especially somewhere for all the kids to go in the evening. I think the Capitol is an outstanding example of the conservation area working. It has a wonderful interior which is preserved and visible to all. Weatherspoons have done a superb job. I would also love to have a cinema here, but one of the size of the Capitol is most unlikely to be commercially viable. Also they'd have carved it up into seperate screens and probably covered the decoration. Not sure it's down to the conservation area working - more to do with the building being listed. We're about to move (from SE23 to SE23!) to Devonshire Road, and when looking at the details of the new place, our solicitors have told us, in reference to a tree in the front yard, that it is within a conservation area. Yes I can confirm this. Up to 6 months ago lived at 120 DR and it was 100% in a conversation area. I think most of the road is.